What’s Orange and Yellow with Polka Dots? 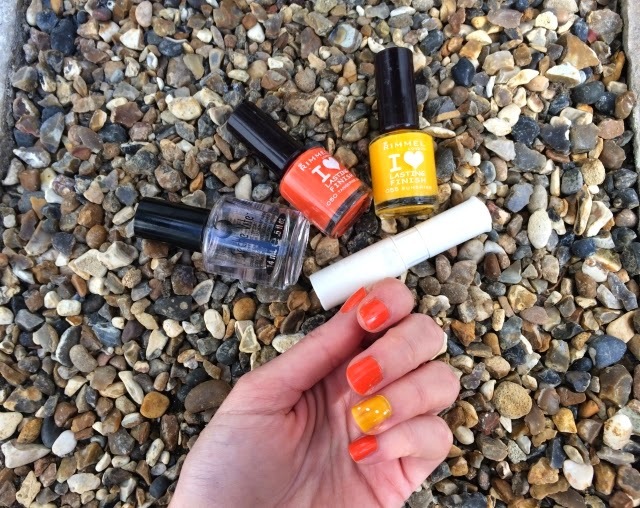 When the sun’s shining it immediately makes me want to paint my nails in the brightest colours I own. This weekend that just so happened to be orange and yellow. I couldn’t just pick one though, so decided to choose both. You might as well go the whole hog right. Rimmel make some of my favourite nail colours in the best consistency, I find that I only need two coats. I added a couple of dots to the yellow nail using my Model’s Own white nail at pen and topped it all off with the Seche Vite top coat which is ruling it for me at the moment. Ta da. Now, even when it’s raining I can just look at my nails for a pop of summer colour.